Alphaman is a fun freeware "Roguelike" (i.e. 100% ASCII-based) game written by Jeff Olson. It is set on Earth's future, following a nuclear disaster. Similar to Electronic Arts' earlier Fountain of Dreams, you take the role of a mutated human who is struggling to save the planet from annihilation. In place of fantasy items such as magical artifacts of Rogue, Alphaman sports technological relics, e.g. high-tech weapons (laser pistol, flamethrower, various grenades) and other equipment (protective suits like the radiation suit, a microwave oven, which can be used to ripen berries, and a microcomputer). 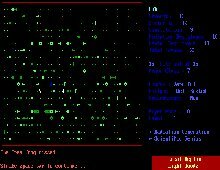 As with all other Roguelike games, it has an ASCII interface and takes place in a post-holocaust wilderness. Despite its unconventional premise and easy interface, though, the game's feel is sparse, lonely, and unfinished. The AI borders on the idiotic (run-towards player, move randomly every once in a while), and the overall gameplay is shallow-- monsters and locations seem to have few distinguishing characteristics, and the plot hardly advances. To Olson's credit, Alphaman features many user-friendly options that ADOM and NetHack should emulate. The game remembers recent castle and lair levels, so remapping is no longer necessary. For example, most dropped items will still be there when you return to a place already visited. Entering 'alphaman somename' will now generate a new character if the saved file somename.alf doesn't exist. There are separate "Halls of the Dead" for the different difficulty levels, and experience bonuses at the end of the game for each "subquest" successfully completed. The Main Map key (F5) shows regions where you've visited (useful for looking for Monoliths). A few new devices -- Flash Grenade, UV Helmet, Geiger Counter, Neutron Suit, Radar Detector -- have been added in version 1.1. Overall, though, Alphaman doesn't offer enough complex gameplay to keep Roguelike fans satisfied. Recommended if you are new to Roguelike games in general, or want to try Rogue in a futuristic setting. Overall, a worthy attempt with discongruous parts that didn't quite gel together into an engrossing game. Worth a look, definitely, and fun for a while.. but don't expect it to be the next NetHack.